Rough go for #Chiefs at the linebacker coaching hires right now. First they go after Antonio Pierce and he stays at Arizona State. Now they go after Matt House and he stays at Kentucky. Onto the next one I guess. On Monday morning, Sports Illustrated’s Monday Morning NFL podcast, Andy Benoit and Gary Gramling broke down the biggest coordinator hires of the NFL offseason. The hiring of Steve Spagnuolo as defensive coordinator of the Kansas City Chiefs was at the top of the list. Benoit said that Spagnuolo will bring an aggressive approach to the Chiefs. I once asked an offensive coach, “Do you like playing against Steve Spagnuolo?” He said, “No, I do not.” I said, “Why is that?” He said, “Because you’re never quite sure what he’s going to do.” He brings a lot at you. This is supported by a film review of a 2016 game between the New York Giants and the Dallas Cowboys. Oliver Connolly said that “Spagnuolo’s game plan was to come for Dak Prescott early and often, uncorking everything in the playbook at the rookie,” noting that in an earlier game between the two teams, Spagnuolo had attempted to bait Prescott into poor decisions running bluff coverages — and Prescott hadn’t been fooled. Things would be different the next time around. Instead of attempting to confuse Prescott post-snap, Spagnuolo attempted to do so pre-snap by using late movements. Even on basic blitz concepts the Giants’ linebackers and secondary were moving constantly prior to the snap and not revealing their hand until just before the snap. Spagnuolo is often presumed to be a clone of former Philadelphia Eagles defensive coordinator Jim Johnson, under whom he served before becoming Giants defensive coordinator in 2007. Both coaches are known to favor blitzes, but Spagnuolo has put his own stamp on the approach. The Star-Ledger pointed out that while Johnson would bring blitzes from anywhere on the field, Spagnuolo preferred to blitz from behind zone coverage. Spagnuolo’s pressures also are often zone blitzes, meaning he’s bringing only five or six rushers with zone coverage behind them. He’ll often bring a linebacker up the middle, a cornerback from the slot and drop the defensive end on the opposite side into coverage. But Spagnuolo isn’t afraid to step out of his own tendencies to match up against a particular opponent. Unfortunately, defensive coordinators don’t always have all the players they want available to them. In 2015, the Giants defense was ravaged by injuries. They had been unable to field the same 11 players for consecutive games since the beginning of the season — and going into a game against the New England Patriots, Spagnuolo was asked why the Giants hadn’t blitzed as much during the 2015 season. “There’s a lot of reasons, I don’t want to go into all of them,” he said. “But one of the things that does get tough is when the parts are changing. There’s certain positions that change a lot. “The group of guys that we have — who I love — play better when you just let them play,” he continued. “Less thinking, just play. I just think we function better that way. So some of the things you’re talking about [with blitzing] take a little bit more [thinking]. So we’ve been trying to stick to things that we do and know and try to play fast, that’s kind of been the motto. Spagnuolo’s record as a defensive coordinator has been inconsistent — sometimes very good and sometimes very bad. But fans who have been frustrated during Bob Sutton’s tenure as Chiefs defensive coordinator can find lots of cause for optimism with Spagnuolo now at the helm. For many fans, his aggressive, bold approach — and an ability to not only adjust that approach to a particular opponent, but also to the players available — is just what the doctor ordered. LEXINGTON, Ky. (WKYT) - The University of Kentucky will be searching for a new defensive coordinator after all, according to reports. WKYT's Dave Baker has confirmed previous media reports that defensive coordinator Matt House will become the linebackers coach for the Kansas City Chiefs. The story was first reported by Kentucky Sports Radio. UK is expected to make an announcement on House. This comes after days of negotiations where it appeared Kentucky was going to retain House as defensive coordinator. The Chiefs made a change at defensive coordinator after the 2018-19 season, as the team's high-powered offense was sometimes offset by its defense which ranked near the bottom of the NFL. The team hired Steve Spagnuolo in January. House worked under Spagnuolo as an assistant with the St. Louis Rams. Kentucky had one of the top defenses in the country in 2018. The Kansas City Chiefs have gotten a lot of production out of wide receiver Tyreek Hill. It’s time to reward the Chiefs number one receiving threat with a contract extension. Tyreek Hill, All-Pro wide receiver for the Kansas City Chiefs, had an incredible season in 2018. Aside from being nearly impossible to catch, and earning himself multiple awards, Hill also broke several personal and franchise records. The Cheetah is well-known for his speed, but its his ability to dodge oncoming defenders is what sets him apart and makes him dangerous. There has been a lot of talk, even since the beginning of the season, that because of his skill set, Tyreek could be getting a huge raise at the end of his contract and quite honestly, it’s about time. In 2016, Tyreek Hill signed a 4 year, $2,586,220 contract with the Kansas City Chiefs, including a $70,000 signing bonus, $100,000 guaranteed, and an average annual salary of $646,555. Tyreek Hill on 49ers RB Matt Breida "the Cheetah"
Hill has scored a career record of 25 touchdowns with 12 of those coming in the 2018 regular season. Along with special teams touchdowns, Hill’s uncanny ability to build up his momentum, and move down the field is homogeneous with Bo Jackson in the Tecmo Bowl, and he is nearly as unstoppable. In the 2018 season opener, Hill successfully ran back a 91 yard touchdown from a punt return against the Los Angeles Chargers. Plays like this are awesome to watch in-game, but going back to watch the film, you see the sheer speed and agility that Hill has developed since his he was drafted by the Chiefs in the fifth round, 165th overall. On this snowy day, according to multiple sources, Sam Madison is a leading candidate to join Steve Spagnuolo’s staff as an assistant in the secondary. Madison was a cornerback under Spagnuolo when the Giants won the 2007 Super Bowl. He could replace Emmitt Thomas. This time of year its easy to get caught up in the frenzy of free agency speculation but the Kansas City Chiefs don’t really need to do much this offseason. It’s that time of year. Fans of the Kansas City Chiefs (and every other NFL team) have officially gone into full armchair GM mode and the online community is ablaze with speculations, predictions, mock drafts, and free agent wish lists. If I’m being honest, I love this time of year. It’s not quite as good as the actual season, but for me, the months leading up to free agency and the NFL draft are more interesting than anything else going on in sports at that time (although I am definitely enjoying the AAF). It’s always fun to try and predict what your favorite team will do. Who will they draft? Who will they cut or re-sign? What free agents will they target? It’s basically the sports equivalent of a little kid coming up with their Christmas list and then trying to guess what’s in the presents under the tree. This is a safe space, so if you’re like me, it’s okay to admit if you’re obsessed with it all. I am. I love looking over the salary cap and contractual information to see what cap space they have to work with and which guys they may be looking to part ways with. I love going over lists of pending free agents to see which ones might be a good fit for the needs that the Chiefs have. I love watching tape of draft prospects to see which ones I think the Chiefs should target. It’s an addiction really. Here’s the problem: we love this process so much that sometimes we lose touch with reality because we’re so swept up in the offseason frenzy. Over the past couple of weeks I feel like many in the Chiefs Kingdom are so caught up in it all that they are starting to set themselves up for disappointment. The ones I’m particularly worried about are those that seem obsessed with the Chiefs trying to clear as much possible cap space as possible heading into the looming free agency period. In the last several days alone I’ve seen Justin Houston, Eric Berry, Daniel Sorensen, Xavier Williams, Dustin Colquitt, Eric Murray, Demarcus Robinson, and Reggie Ragland all proposed as cuts to clear cap space plus letting almost every pending free agent walk (including Dee Ford). Now, while cutting all those players (and not re-signing any) would leave the Chiefs with roughly $65 million in cap space (Berry would have to be cut post-June 1 to maximize his savings) it would also leave Kansas City with a ton of holes on their roster to fill. Now, if the Chiefs were a losing team that was trying to start fresh and rebuild their roster that would make a lot of sense. When a new coach and general manager come to town they often clean house and bring in a bunch of new players to turn things around. However, Andy Reid and Brett Veach aren’t new to Kansas City. The Chiefs aren’t in rebuild mode. In fact, they had the best record in the AFC last season and were a Dee Ford penalty away from going to the Super Bowl. I know, I know, the defense was a mess and if you want to argue that the defense should be blown up and rebuilt from the ground up you can at least make a logical argument for that. Here’s the thing though. The Chiefs want to win the Super Bowl next season. Yes, they brought in a new defensive staff but a major reason for that is because they likely believed that Bob Sutton wasn’t getting the most out of the talent they had. I would also guess that a big selling point for hiring new defensive coordinator Steve Spagnuolo is that he believed he could win with guys the Chiefs already had on the roster. Do you really believe that a team that was this close to going to the Super Bowl is going to hire a new defensive coordinator who comes in and says “Okay, I’ll take the job but we’re going to have to blow this thing up and start over.” No way, the Chiefs aren’t looking for drastic changes—just some adjustments and maybe an upgrade here or there—and I believe that’s exactly the right call. It may not make for the most exciting offseason in team history, but if it leads to a Super Bowl run, then who cares if we were bored during free agency in March? My other question is just what are you wanting the Chiefs to clear cap space for? Keep in mind that this team’s biggest free agent signings last season were Sammy Watkins and Anthony Hitchens. Are those the kind of guys you think this team needs more of to make a Super Bowl? Fans keep drooling over guys like Jadeveon Clowney, Anthony Barr, and Landon Collins but those guys are just going to demand huge contracts like the ones we’re wanting to get out of with guys like Justin Houston and Eric Berry. Those guys are fun to dream about but in the real world, even if you did cut everybody under the sun, you’re still probably only signing one of those guys to a huge deal. It just doesn’t make sense to put yourself in a bad cap position in the coming years with Patrick Mahomes mega deal looming on the horizon. The fact of the matter is that while we may be growing tired of Justin Houston and Eric Berry’s big contract numbers with declining production, their contracts won’t be a hindrance for the Chiefs when it’s time to pay Mahomes. If the Chiefs just pay Houston what he’s due this coming season then they can walk away from him with only $1.5 million in dead money next offseason. Berry’s deal isn’t quite as clean cut, but if they did decide to part ways with him it wouldn’t be a difficult cap hit to overcome. I’ve been saying since Spagnuolo was brought in that the Chiefs were tied for the league lead in sacks last season despite Bob Sutton because of the talents of Dee Ford, Justin Houston, and Chris Jones. So the smart play is to give Spagnuolo all three of those guys back and turn them loose in his attacking defense. Personally, I’d franchise tag Ford and see if he stays healthy and thrives in the new defense before giving him any long-term deal. It’s still probably financially easier to just pay Ford the tag number than getting in a bidding war on the open market for someone like Clowney (who’s never even had a double-digit sack season) and by the quotes coming from the team, it certainly sounds like they are planning on bringing Ford back. When I look at the Chiefs’ current roster and add Ford on with the franchise tag, I don’t really see that many holes. They could field a starting offense with just the guys they have under contract that would be every bit as good as last year. Would I like to see them add a better second tight end, another running back, and some offensive line depth? Sure, but none of those need to be a big-name free agent signing. Even on defens,e I don’t see a massive amount of holes. I think you could pretty much fill your front seven with guys they currently have (plus Ford). Would it be nice to add a player or two that Spagnuolo thinks are good fits for his system up front? Sure, but again I don’t see a need to go out and break the bank in free agency for anyone there. The real question marks are in the secondary. I think you can pencil in Kendall Fuller and Charvarius Ward as two of the top three corners next season. I didn’t see enough from Tremon Smith to make me feel confident that he’s safe to put in the starting rotation. So the Chiefs will need to invest at cornerback. That could be an early draft pick, re-signing Steven Nelson, or signing a proven free agent. Then there’s the safety position. They currently have Eric Berry, Daniel Sorensen, Eric Murray, and Armani Watts under contract and Jordan Lucas is a restricted free agent so the Chiefs could easily bring him back if they wanted to. If the Chiefs believe Eric Berry will be able to play in 2019, could they just bring Lucas back and go with this group? Yes, they absolutely could. In which case, there would be no reason to spend any more money on this position in free agency. If they are worried about Berry or decide to cut ties with him then this would become a position where they absolutely could go out and sign someone. I would be shocked if they kept both Berry and Sorensen and still made a significant signing. As the roster currently stands, the Chiefs have one definite need: cornerback. Depending on what they decide to do with their current safeties, you could add that to the list as well. Everything else is really just needs for depth and competition. You don’t need $65 million in cap space for that. Even if they want to give guys like Tyreek Hill and Chris Jones new deals, the cap hits for the first year aren’t typically that big since the players get a large signing bonus that doesn’t all count against the cap that first year. In fact, the likely re-signing of Hill and Jones probably makes it even less likely that they would give out many other huge contracts this offseason. The other thing I always hear about but just doesn’t make any sense is renegotiating deals for guys like Houston and Berry. First off, no player in their right mind is just going to give up money. That doesn’t happen. Period. What does happen is moving the money they are already owed around to help with their cap numbers this season. The problem with that is that it means they will have more guaranteed money due to them after this season. When you are talking about guys who’s play has dropped off some as they have gotten older the last thing you want to do is make more of their money guaranteed later in their contract. If you don’t think 30-year-old Justin Houston is worth what he’s owed this season why would you want to guarantee more of 31-year-old Justin Houston’s contract? My guess is that in the coming week we will find out that the Chiefs are using the franchise tag on Dee Ford. That will leave cornerback as the single biggest spot to fill on the team. After that, the Chiefs will just need to figure out what they are doing with their current group of safeties. If they feel they can count on Berry for next year I wouldn’t anticipate a big move there. If they are worried about Berry, then they may decide to move on from either him or Sorensen to create some cap space to bring a proven starter in. The rest of free agency will likely be pretty quiet as the Chiefs look for guys that they can bring in to compete on reasonable, team-friendly contracts. The Chiefs were one of the best teams in football last season and are returning almost all of the key players from that team. That’s a very good thing and a huge reason why the Chiefs opened as the betting favorite to win the Super Bowl next season. Chiefs fans just need to keep that in mind when their isn’t a lot of exciting news about their team when the free agency media frenzy begins. It’s much more important to win games next January than it is to win free agency headlines this coming March and history has shown that the teams that win one rarely win the other. The Chiefs have added an offensive lineman to their offseason roster. Justin Senior announced on Instagram that he has signed a contract with the Chiefs. There has yet to be an announcement from the team about the deal. According to a report from NFL Network reporter Tom Pelissero, the Kansas City Chiefs are “expected” to place the franchise tag on their sixth-year linebacker Dee Ford. This news is hardly unexpected. Many Chiefs fans have been arguing for such a move, and Chiefs general manager Brett Veach has made it pretty clear that Ford will be a significant part of the 2019 Chiefs defense. Based on what he has said recently, Ford has been expecting the Chiefs could make this move. Should the franchise tag be placed on Ford, his 2019 salary would be somewhere around $18.7 million. The Chiefs are reported to have between $24 and $25 million in salary cap space in 2019, so it is likely that if Ford is given the franchise tag, the Chiefs will need to make some moves to free up cap space; it has previously been reported that signing deals with wide receiver Tyreek Hill and defensive lineman Chris Jones — along with Ford — will be a priority before the 2019 season. Under NFL rules, the franchise tag must be placed on a player between February 19 and March 5. It is not unusual for teams to wait until late in that window to actually place the franchise tag on a player. Chosen in the first round of the 2013 NFL draft, Ford is a free agent. He has appeared in 67 of the 80 regular-season games since his arrival in Kansas City and started 41 of them. During his five seasons with the Chiefs, Ford has recorded 30.5 sacks, 69 quarterback hits, 136 tackles — including 36 tackles for loss — nine forced fumbles (including seven in 2018 alone) and six passes defensed. After the Kansas City Chiefs announced the changes to their defensive coaching staff on Tuesday night via a press release, Steve Spagnuolo—the Chiefs’ new defensive coordinator—spoke with the local media via a conference call on Wednesday afternoon. It was the first media opportunity for the veteran defensive coach, who re-joins Andy Reid, with whom he spent eight years as a defensive assistant with the Philadelphia Eagles (1999-2006) before making stops with the New York Giants (2007-08, 2015-17) St. Louis Rams (2009-11), New Orleans Saints (2012) and Baltimore Ravens (2013-14). Question: How much do you know about the guys who are going to be playing for you next year, understanding some of them are yet to come through the draft and free agency? “That’s the exciting part about this time in the NFL calendar. You don’t really know what you have yet, but you can anticipate what you are hoping to get. We have, as a coaching staff, had the opportunity to study last year’s film, do the best assessment we can as to the talent we have and the type of players we have. With that, certainly, Brett Veach chimes in and help us out. I will say this is a long process to figure out who and what we have and how it fits. Question: From what you’ve seen from the front seven, do you see guys versatile enough to play in whatever scheme you might put together? Question: What did the year away (from football last year) do for you and what was it like? “First off, I’m glad I did it. There might have been another year I should’ve done it. I found it to be both challenging and rewarding. The challenge was missing football and the comradery of coaches, players, not being at training camp where it’s nice and hot and you are doing football, that was a challenge, was missing it. The rewards were sitting back and seeing a big picture view of the NFL and the game of football, as opposed to being in these buildings during the season and having the blinders on to the team you are about to play. I just thought a big picture view of the league, the game of football, the pluses and minuses, I have oodles of notes. Question: How important was it for you to get a staff that you are comfortable with and have a history with? “I do think that’s always important. Coach (Andy) Reid was tremendous. A bunch of coaches had obviously left here for other jobs where there were openings. Andy and I put our heads together. It was a little bit of a long process, but I think it was long for a good reason. I think we got the right people. You’re right in the fact that many of these guys I have a history with, and that’s really, really important. Especially, when you start out this process, even in the meetings that we’ve had, we started right out with terminology because you can’t fit in here and talk football unless you’re all speaking the same language. Question: How attractive was this Chiefs defensive coordinator position for considering how high-powered the offense was last year? “I think you won’t talk to a defensive coach in the NFL that doesn’t say they’d like to be on a team with A) a really good head football coach, and B) a really good quarterback. We all know in today’s football in this league if you don’t have that position, you don’t feel good about that position the quarterback, you’re always looking for one and the whole rest of the team is affected when you’re looking for it. A quick-and-dirty review of some of the things we learned in the first media opportunity for the Chiefs new DC. 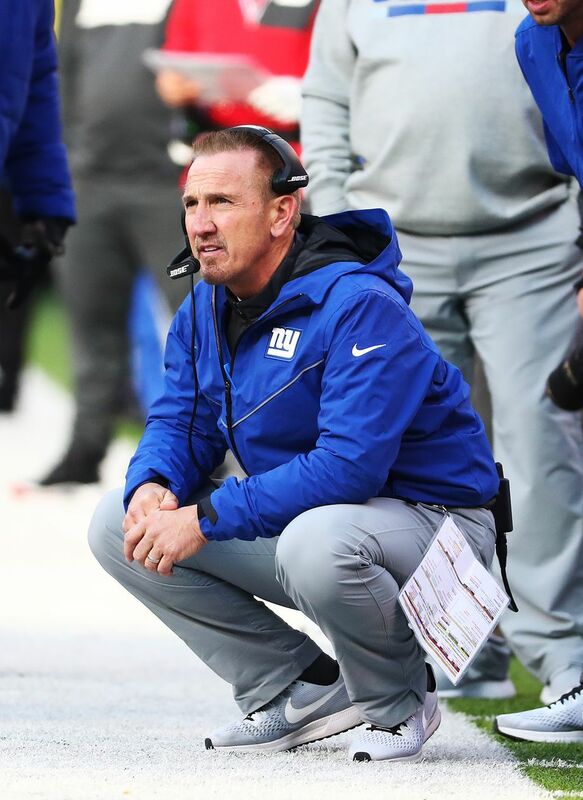 It was a long time coming (we knew the Kansas City Chiefs had hired him nearly a month ago), but defensive coordinator Steve Spagnuolo held his first teleconference on Wednesday. 1. Spagnuolo already seems like a standup, likable guy. 2. 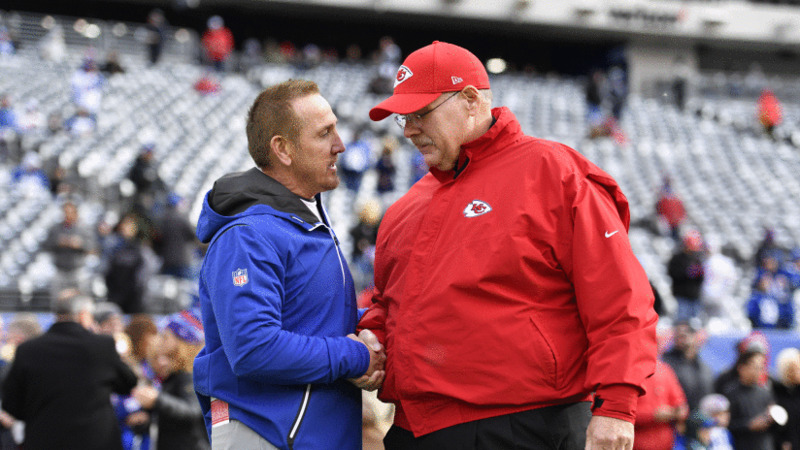 Spagnuolo relishes another opportunity to coach with Andy Reid. 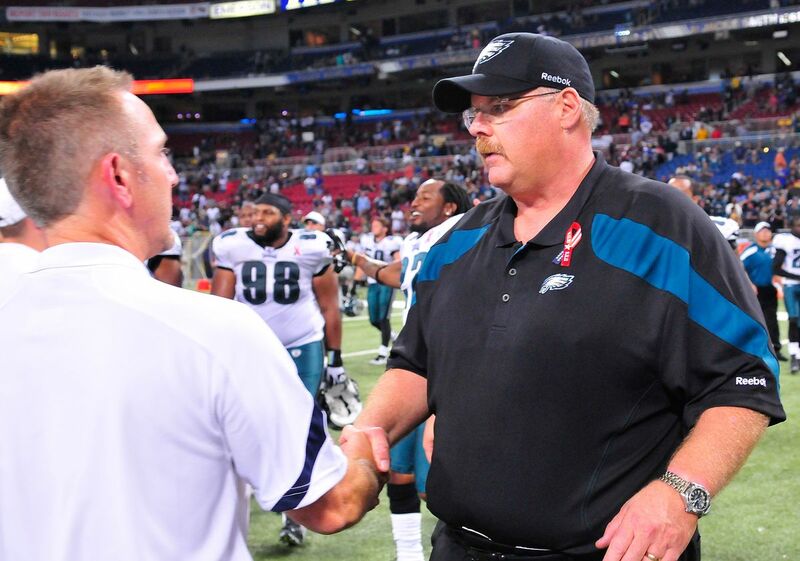 Photo by Jeff Curry/Getty Images Spagnuolo served as a defensive assistant (1999-2000), defensive backs coach (2001-2003) and linebackers coach (2004-2006) under Andy Reid while he was the head coach of the Philadelphia Eagles (1999-2012). Spagnuolo was the St. Louis Rams head coach from 2009-11 before he was let go in 2012. 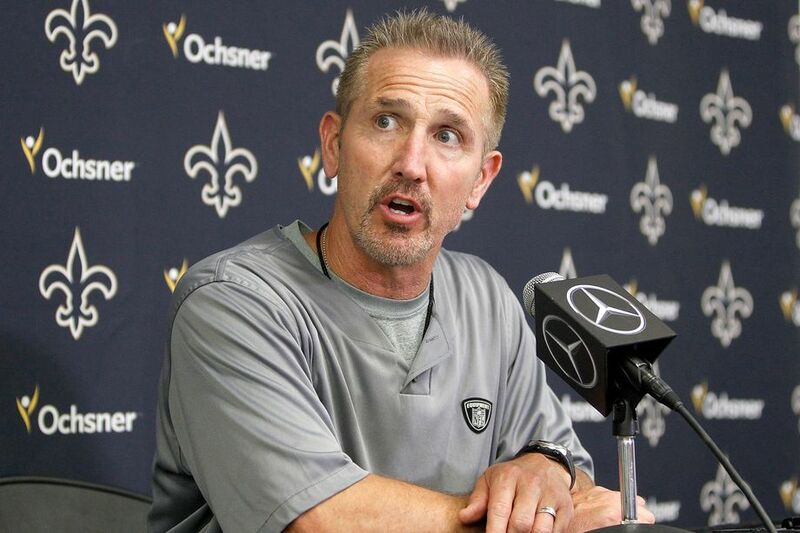 Reports from 2012 suggested that at that time, Reid offered Spagnuolo a role, but Spagnuolo opted to take a job as Saints defensive coordinator instead. 3. As one would expect, Patrick Mahomes and the Chiefs offense did indeed make Kansas City an attractive destination. Photo by Jamie Squire/Getty Images The 2018 Chiefs were No. 1 in yards per game (425.6) and No. 1 points per game (35.3), both in great thanks to Patrick Mahomes, who went on to win the AP NFL MVP award. So yes, as you would assume, Spagnuolo explained that the Chiefs offense makes Kansas City a desirable place to work. There has been a question as to whether Ford would go back to the defensive end position, where he played during his college career at Auburn. Some great unintentional pun work by Spagnuolo there at the end of the quote. As Craig Stout wrote Wednesday morning, the Chiefs sent a message when they chose to reboot the defensive staff, replacing or moving each and every defensive positional coach. Spagnuolo explained exactly why it was necessary to do so. “I do think [having a history with assistants] is always important,” he said. “Coach Reid was tremendous—a bunch of coaches left here for other jobs and there were openings. Andy and I put our heads together. It was a little bit of a long process, but I think it was long for a good reason. I think we got the right people... Many of these guys I have a history with and that’s really important, especially when you start out this process—even in the meetings that we’ve had, we start out right with terminology because you can’t sit here and talk football unless you’re speaking the same language. Justin Houston may be in his final days with the Kansas City Chiefs, according to NFL national reporter Matt Verderame of FanSided. Verderame reported Thursday afternoon that the Chiefs in most likelihood will not be keeping both Houston, who is due for a $21.1 million cap number in 2019, and Dee Ford, who is heading towards free agency and is expected to get the franchise tag. That would make Houston the odd man out, as Verderame says he is unlikely to take a paycut as part of a contract restructure. "Houston, 30, is unlikely to be with the Chiefs next season, per multiple conversations within the league," wrote Verderame. "The four-time Pro Bowler is unwilling to take a pay cut without getting more guaranteed money in future seasons. With the Chiefs current cap situation, there’s a strong likelihood that they would rather release Houston and save $14 million against their books in 2019." Houston has been speculated to be a possible cap casualty for the last few weeks, while others have raised the idea of him being a trade candidate. Chiefs general manager Brett Veach mentioned Houston during a February 7 conference call, saying the team had not brought up the possibility of a restructure. Houston joined the Chiefs as a third-round draft pick out of the University of Georgia in 2011 and quickly became one of the league’s most feared pass rushers, totaling 48.5 sacks over his first four seasons. Houston posted a club-record 22 sacks in 2014, which is tied with Jared Allen (2011) and Mark Gastineau (1984) for the second-highest single season total behind Michael Strahan’s 22.5 (2001) since the league began tracking sacks in 1982. The Chiefs rewarded Houston with a six-year, $101 million contract extension in July of 2015, but a torn ACL caused him to miss the final five games of the 2015 season as well as most of the 2016 season. Houston rebounded to total 59 tackles and 9.5 sacks in 15 games in 2017 but admitted in July of 2018 that he played the previous season without full strength in his leg. He headed towards the 2018 season finally feeling 100 percent health-wise but wound up being sidelined for four games in October and November due to a hamstring injury. Houston still made an impact last season when healthy, finishing the year with nine sacks, five forced fumbles and one interception. With the NFL Scouting Combine on the way next week (February 26 to March 4), more could known soon about Houston's chances of being back in a Chiefs uniform next season. If his days in Kansas City are indeed done, Houston will certainly find his share of interest from other teams, and it's not out of the realm of possibility to think the Chiefs could find a trade partner for him given the need for quality pass rushers around the league. The Chiefs announced the signings of four free agents, including quarterback E.J. Manuel. They also signed receivers Sammie Coates and Davon Grayson and defensive back Dontae Johnson. The Chiefs had one of the most explosive offenses in the NFL in 2018. While many would be content to focus purely on the defensive side of the ball during free agency and the draft, good teams don’t ignore the opportunity for improvements. There are plenty of pending free agents that the Chiefs can add to this offense in order to make it better. With some expected departures on offensive side of the ball, they’ll need to reload and rebuild their depth. I’ve identified three pending free agents that I think can come in an make a difference on offense. The Chiefs should prioritize and pursue each of these players when the free agency period begins March 13. They won’t be able to sign every player I’ve suggested here or on the defensive side of the ball. That doesn’t mean they shouldn’t look into them. The Kansas City Chiefs are expected to let Mitch Morse walk in free agency. They’ve extended Austin Reiter, but as we learned this season, they need to be deep along the offensive interior. Brett Jones hails from Canada and got his start with the CFL before joining the NFL. He played for the Calgary Stampeders before signing with the New York Giants in 2015. It’s certainly a bonus that Jones can join the Chiefs’ throng of Canadian offensive lineman. Jones was traded to the Vikings from the Giants in 2018. This came after a career-best 2017 season with the Giants, part of which came under interim head coach Steve Spagnuolo. There was an expectation Jones would compete for the starting job with the Vikings given his 2017 performance. He ultimately won that job out of the preseason, but by Week 4 he’d been replaced by Pat Elfein. My understanding is this wasn’t a performance issue, but the front office wanted to see their guy playing. Most of Jones’ 2018 season was spent on the bench because of that. The Chiefs need to build more competitive depth along the offensive line as their set to lose Morse and another two contributors. Jones was paid just $2.9 million for his services in 2018. The Chiefs could likely sign him to a deal that wouldn’t hamstring the team if he didn’t win a starting job. Maxx Williams may be the odd man out for Baltimore this offseason. In 2018 the Ravens drafted Hayden Hurst and Mark Andrews. It seemed to be out of frustration because they really couldn’t keep guys healthy during the past several seasons. Williams made it through his rookie season in 2015 healthy, and it was his best season to date in terms of yardage and receptions. It still wasn’t a huge offensive impact though. During the 2016 season Williams suffered a knee injury that sent him to injured reserve. In 2017, he couldn’t secure a starting job and was the third tight end out of training camp. He suffered a mid-season ankle injury that kept him sidelined for three games. Injuries mostly derailed any consistent production out of this player. By the 2018 season, Williams found himself on the roster bubble. He managed to hold onto his job, but the Ravens carried four tight ends on the roster. Williams was No. 2 of those four tight ends per Pro Football Focus grading. He only started a total of six games and outperformed Hayden Hurst and Nick Boyle. Williams is only 24 years old. He still has plenty of room to grow. Right now blocking seems to be where he does his best work. He’s lined up as a fullback, in the wings, and in-line as a blocker for the Ravens. He also does a good job blocking in space. In 2015 he proved to have reliable hands, but the Ravens never utilized him in the passing game the same way after that season. Chiefs fans have been begging for an upgrade at the second tight end spot for a while now. With Demetrius Harris scheduled to become a free agent, there is a chance they’ll be in the market for that upgrade. Williams has the potential to be an upgrade, he just needs to be utilized properly and remain healthy. Breshad Perriman NFL career got off to a turbulent start. His rookie season in 2015 was lost to a PCL Injury. Ahead of the 2016 season, Perriman suffered a partially torn ACL. This didn’t knock him out for the 2016 season, but it certainly stunted his growth as a player. Speed was a big part of his game and knee injuries really put a damper on that. Eventually the Ravens declined Perriman’s 5th year option and let him walk in free agency. In 2018 Perriman spent about a week in Washington before being waived. He didn’t get another opportunity until October when he signed with the Cleveland Browns. Perriman finished the 2018 season with 16 receptions for 340 yards and 2 touchdowns. That production may not seem like a whole lot, but the most encouraging thing about Perriman wasn’t the numbers. If you turn on the tape, you see an entirely different player from his time in Baltimore. He’s catching the football, whether he gets open with speed or needs to make a contested catch. He’s functioning as a more complete receiver and not just a speed threat. There were reports out of Cleveland that he was really buying in and thriving off the energy the team had. The Browns recently signed former Texans receiver Jaelen Strong, so the expectation is that Perriman will not be back in Cleveland. The Chiefs have a similar youthful exuberance on offense under Patrick Mahomes, so I have a feeling Perriman would fit right in. Kansas City Chiefs defensive leader Eric Berry dealt with heel problems throughout last season. He was never at 100 percent, and ​everyone expected him to undergo surgery this offseason considering his issue with Haglund's deformity never truly allowed him to play at 100 percent. Luckily for Berry and the Chiefs, he sought out a second opinion with Dr. Bob Anderson​ and it was determined surgery isn't required this offseason. Chiefs safety Eric Berry went to Dr. Bob Anderson for a second opinion on his injured heel, and he felt surgery wasn’t necessary, per a source. Berry expects to participate in all off season activities. Having Berry present for offseason workouts and team meetings will go a long way for the ​Chiefs defense. They're expected to add some depth on defense and have seven picks to do so. Berry is a proven leader on and off the field, and his presence will benefit the young ​Chiefs on both sides of the ball. At several points in his media session, Andy Reid made it clear he expects Eric Berry to return this summer healthy after learning surgery on his right heel isn’t necessary. The Chiefs offense was atop the ​NFL all season, but their defense clearly held them back in some capacity, which clearly indicates that will be the focus of the front office heading into 2019. They came one game away from the Super Bowl, so an improved defense gives them a legitimate chance to get there with Patrick Mahomes leading the offense. Chiefs tight end Travis Kelce recently underwent ankle surgery, NFL Media reports. It was a “cleanup” procedure. The All-Pro will miss some time in the team’s offseason program, but he is expected back for the start of training camp. Kelce, 29, caught 103 passes for 1,336 yards and 10 touchdowns last season in earning a fourth Pro Bowl honor and second All-Pro. In six years with the Chiefs, he has 410 receptions for 5,236 yards and 32 touchdowns. Chiefs are placing their franchise tag on LB Dee Ford today and plan to play with him this season, but with the change to a 4-3 defensive scheme, they will listen to trade offers for their franchised player, per league sources. The Chiefs have officially franchised DE/OLB Dee Ford, per source. KANSAS CITY, Mo. 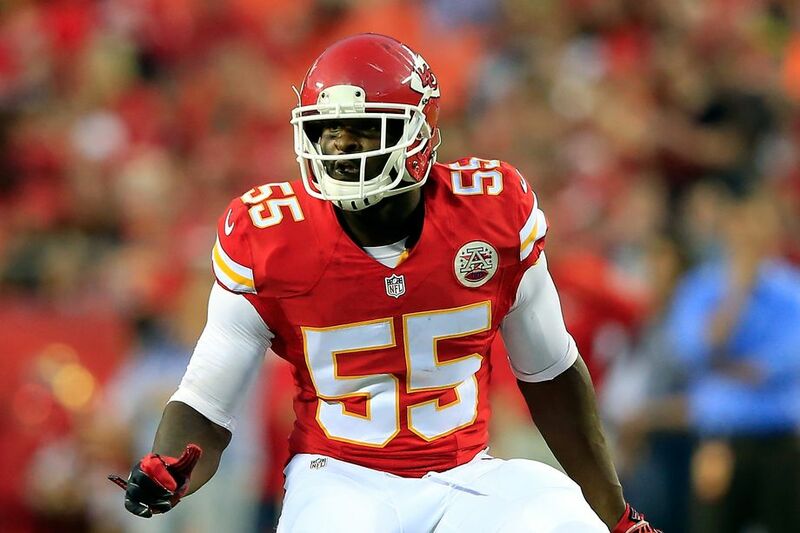 -- Dee Ford and Justin Houston combined for 22 sacks last season and 47.5 the past three seasons for the Chiefs. But it's possible that neither will play for Kansas City in 2019. The Chiefs placed the franchise tag on Ford on Monday but are listening to trade offers for the outside linebacker and have received interest from multiple teams, sources told ESPN's Adam Schefter. Kansas City is open to bringing Ford back, though, in the event that it does not find a suitable trade partner. Houston has also been informed that the Chiefs will try to trade him, a source told ESPN, and if no deal is reached he will be released. Houston carries a salary-cap number of $21.1 million for next season; trading or releasing him would save the Chiefs $14 million against the salary cap. The Chiefs intend to switch their base defensive scheme from a 3-4 to a 4-3 under new coordinator Steve Spagnuolo, necessitating a position change for both players. They would be defensive ends in the new system after playing outside linebacker in the 3-4. Ford, who will turn 28 on March 19, finally became the player the Chiefs envisioned when they drafted him from Auburn in the first round in 2014. Ford started all 16 games for the first time in his career and had a career high of 13 sacks. He was also selected to play in the Pro Bowl for the first time. The wait for Ford to become a consistently productive player was a long one. He had a total of 17.5 sacks in his first four seasons. Ten of those sacks came in a nine-game stretch in 2016. Otherwise, until 2018, Ford had 7.5 sacks to show for his other 42 games. Ford ended his best season with his least productive game. 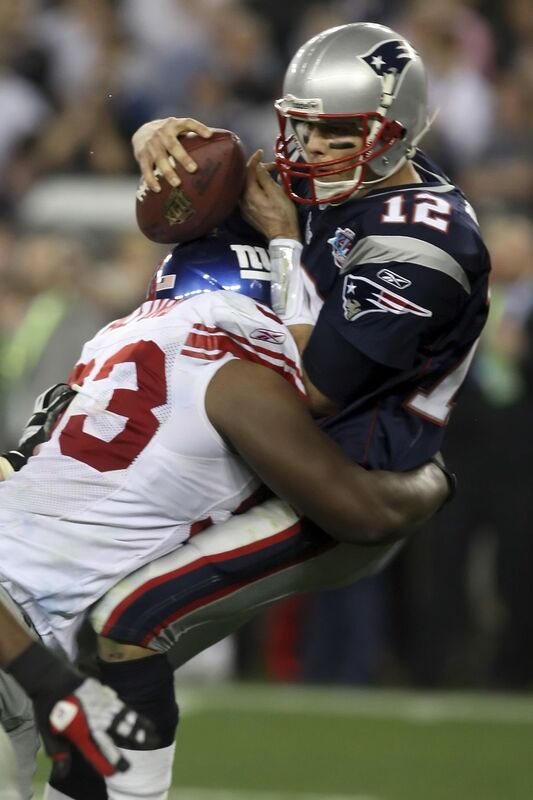 He had no sacks or tackles in the Chiefs' AFC Championship Game loss to the New England Patriots. Ford was also penalized for lining up offside on a play that resulted in an interception in the final minute of the fourth quarter. Houston, who turned 30 in January, joined the Chiefs as a third-round draft pick (70th overall) from Georgia in 2011. He showed his immense pass-rush ability by getting three sacks in a game against the Bears as a rookie. He had 22 sacks in 2014, missing the NFL record by a half-sack. Houston hasn't come close to that standard since. His best sack total the past four seasons was 9.5 in 2017. He has 78.5 career sacks, putting him fourth on the Chiefs' all-time list. Houston in 2015 signed a six-year contract worth $101 million, making him at the time the highest-paid defensive player in NFL history. He was more than just a pass-rusher for the Chiefs. He was an excellent all-around player who defended the run well. He was chosen to play in the Pro Bowl three times and was a first-team All-Pro selection in 2014. The Chiefs are expected to part ways with Justin Houston, and are reportedly open to the possibility of trading franchise-tagged Dee Ford. That would be a lot of money coming off the books. They have plans for it. According to Ian Rapoport of the NFL Network, the Chiefs have begun negotiations with wide receiver Tyreek Hill on what would be a massive contract. The former fifth-round pick is entering the final year of his rookie deal, and this is the first chance they have to pay him (you can’t extend rookie deals before three years have passed). He has 3,255 receiving yards, 477 receiving yards, and 29 combined touchdowns in three seasons, with the kind of game-breaking speed that makes any pla a potential big play. The Chiefs have signed free agent DB Harold Jones-Quartey.